The Government Finance Officers Association of the United States and Canada (GFOA) awarded the Cook County Department of Budget and Management Services its Distinguished Budget Presentation Award for meeting the highest principles of governmental budgeting. “Congratulations to the dedicated and hardworking budget department, which has earned this honor from the Government Finance Officers Association of the United States and Canada,” Cook County Board President Toni Preckwinkle said. 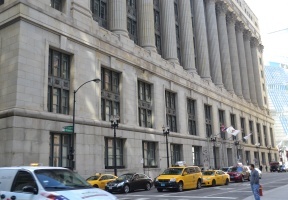 “Through their diligence and use of budgeting best practices, Cook County has created balanced and responsible budgets that are easily available online for residents.” In order to be eligible for the budget award, Cook County had to meet nationally-recognized guidelines for effective budget presentations. These benchmarks are designed to evaluate how well a government budget serves as a policy document, financial plan, operations guide and communications device. According to the GFOA, the budget award represents the highest form of recognition in governmental budgeting aimed at honoring recipients that have pioneered efforts to improve the quality of budgeting and set high standard for other governments throughout the country.